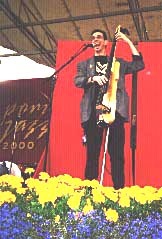 Ritt performing on the Main Stage @ the 35th Annual Pori Jazz Festival in Finland, July 2000, between Freddie Hubbard and Bela Fleck & the Flecktones. Got to hang & play with cats from Finland, Turkey, Russia, Germany, Georgia (the one over there), Orlando (the one over here) & Woodland Hills. Besides playin', the highlight of the week over there was hangin' with the guys from Buena Vista Social Club, who were headlining the festival. I got the gig by playing a Christmas gig at Borders in Pasadena. I ended a tune with a Picardy Third (ending a minor tune with a major third), & this guy next to me sez, "Y'know, in ancient times that was considered sacrilege." I go, "Whoa, Mr. Musicologist over here." He sez, "My wife's a singer, she's over there gettin' coffee, you should have her come up & sing with you." So she does, & it turns out he's one of the promoters of the festival. Kismet, baby. Click here for more Pori photos. 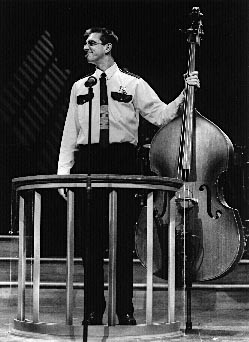 Ritt as Officer Bell in the world premeire production of "The People vs. Mona" at the Pasadena Playhouse, Spring 2000. This was a courtroom musical dramedy co-written by Jim Wann, a co-creator of "Pump Boys & Dinettes." (In fact I did "Pump Boys" with Jim in L.A. in '86.) Mona's accused of killing her heinous husband, a record producer, by hitting him over the head with a guitar. Bell's one of the witnesses testifying at the trial. His biggest thrill in life: Portraying Curley in the local theatre production of "Oklahoma." (Think booming bass/baritone voice. Every note reaches the rafters. The guy's a ham. It was a stretch, but I managed.) In the end, it turns out I'm the murderer. When I'd confess, the crowd would erupt in applause & I'd throw kisses to the balcony. Now that's my kind of gig. Click here for more Mona photos.